Typical grocery store on 8th Avenue in one of the Brooklyn Chinatowns (布鲁克林華埠) on Long Island, New York, USA. 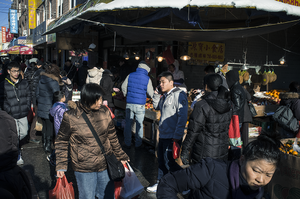 New York City's multiple Chinatowns in Queens (法拉盛華埠), Manhattan (紐約華埠), and Brooklyn are thriving as traditionally urban enclaves, as large-scale Chinese immigration continues into New York, with the largest metropolitan Chinese population outside Asia, The New York metropolitan area contains the largest ethnic Chinese population outside of Asia, comprising an estimated 893,697 uniracial individuals as of 2017. Waves of Chinese emigration (also known as the Chinese diaspora) have happened throughout history. The mass emigration known as the Chinese diaspora, which occurred from the 19th century to 1949, was mainly caused by wars and starvation in mainland China, invasion from various foreign countries, as well as problems resulting from political corruption. Most emigrants were illiterate peasants and manual labourers, who emigrated to work in places such as the Americas, Australia, South Africa, Southeast Asia, and Zealandia. According to Lynn Pan's book Sons of the Yellow Emperor, the Chinese coolie emigration began after slavery was abolished throughout the British possessions. Facing a desperate shortage of manpower, European merchants looked to replace African slaves with indentured laborers from China and India. A British Guiana planter found what he was looking for in the Chinese laborers: "their eagerness to make money and their history of toil from infancy". Labour recruiters sold the services of large numbers of unskilled Chinese in the coolie trade to planters in colonies overseas in exchange for money to feed their families. This type of trading was known as Mai Zhu Zai (simplified Chinese: 卖猪仔; traditional Chinese: 賣豬仔; pinyin: mài zhū zǎi; literally: 'selling piglets') to the Chinese. The laborers' lives were very harsh. Some labor recruiters promised good pay and good working conditions to get men signed onto three-year labor contracts. It was recorded that on one pepper estate, fifty coolies hired, only two survived in half a year. Most coolies were treated badly, and many died en route to South America and South Africa because of bad transport conditions. Usually, they were cheated of their wages and were unable to return to China after their contracts expired. 210 BCE: Qin Shi Huang (Chinese: 秦始皇) dispatched Xu Fu (Chinese: 徐福) to sail overseas in search of elixirs of immortality, accompanied by 3,000 virgin boys and girls. Records suggest Xu Fu's expedition settled in Honshu, Japan. From the Han Dynasty onwards, Chinese military and agricultural colonies (Chinese: 屯田) were established at various times in the Western Regions, which in the early periods were lands largely occupied by an Indo-European people called the Tocharians. 661 CE: under the Tang dynasty, Zheng Guo Xi of Nan An, Fujian was buried at a Philippine island. 7–8th century: the Arabs recorded large numbers of Tang traders residing at the mouth of the Tigris and Euphrates rivers, and they had families there. 10th century: Arab trader Masuoti recorded in his Golden Ley, in the year 943 CE, he sailed past Srivijaya and saw many Chinese people farming there, especially at Palembang. These people migrated to Nanyang (南洋) to evade chaos caused by war during the Tang dynasty of China. Many Chinese merchants chose to settle down in the Southeast Asian ports such as Champa, Cambodia, Java, and Sumatra, and married the native women. Their children carried on trade. Borneo: Many Chinese lived in Borneo as recorded by Zheng He. Cambodia: Envoy of Yuan dynasty, Zhou Daguan (Chinese: 周达观) recorded in his The Customs of Chenla (Chinese: 真腊风土记), that there were many Chinese, especially sailors, who lived there. Many intermarried with the local women. Champa: the Daoyi Zhilüe documents Chinese merchants who went to Cham ports in Champa, married Cham women, to whom they regularly returned to after trading voyages. A Chinese merchant from Quanzhou, Wang Yuanmao, traded extensively with Champa, and married a Cham princess. Han Chinese settlers came during the Malacca Empire in the early 15th century. The friendly diplomatic relations between China and Malacca culminated during the reign of Sultan Mansur Syah, who married the Chinese princess Hang Li Po. A senior minister of state and five hundred youths and maids of noble birth accompanied the princess to Malacca. Admiral Zheng He had also brought along 100 bachelors to Malacca. The descendants of these two groups of people, mostly from Fujian province, are called the Baba (men) and Nyonya (women). Java: Zheng He's 鄭和 compatriot Ma Huan (Chinese: 馬歡) recorded in his book Yingya Shenglan (Chinese: 瀛涯胜览) that large numbers of Chinese lived in the Majapahit Empire on Java, especially in Surabaya (Chinese: 泗水). The place where the Chinese lived was called New Village (新村), with many originally from Canton, Zhangzhou and Quanzhou. Ryūkyū Kingdom: Many Chinese moved to Ryukyu to serve the government or engage in business during this period. The Ming dynasty sent from Fujian 36 Chinese families at the request of the Ryukyuan King to manage oceanic dealings in the kingdom in 1392 during the Hongwu Emperor's reign. Many Ryukyuan officials were descended from these Chinese immigrants, being born in China or having Chinese grandfathers. They assisted in the Ryukyuans in advancing their technology and diplomatic relations. Siam: According to the clan chart of family name Lim, Gan, Ng, Khaw, Cheah, many Chinese traders lived there. They were amongst some of the Siamese envoys sent to China. In 1405, under the Ming dynasty, Tan Sheng Shou, the Battalion Commander Yang Xin (Chinese: 杨欣) and others were sent to Java's Old Port (Palembang; 旧港) to bring the absconder Liang Dao Ming (Chinese: 梁道明) and others to negotiate pacification. He took his family and fled to live in this place, where he remained for many years. Thousands of military personnel and civilians from Guangdong and Fujian followed him there and chose Dao Ming as their leader. Early Chinese mariners had a variety of contacts with Kenya. Archaeologists have found Chinese porcelains made during the Tang dynasty (618-907) in Kenyan villages; however, these were believed to have been brought over by Zheng He during his 15th century ocean voyages. On Lamu Island off the Kenyan coast, local oral tradition maintains that 20 shipwrecked Chinese sailors, possibly part of Zheng's fleet, washed up on shore there hundreds of years ago. Given permission to settle by local tribes after having killed a dangerous python, they converted to Islam and married local women. Now, they are believed to have just six descendants left there; in 2002, DNA tests conducted on one of the women confirmed that she was of Chinese descent. Her daughter, Mwamaka Sharifu, later received a PRC government scholarship to study traditional Chinese medicine (TCM) in China. On Pate Island, Frank Viviano described in a July 2005 National Geographic article how ceramic fragments had been found around Lamu which the administrative officer of the local Swahili history museum claimed were of Chinese origin, specifically from Zheng He's voyage to East Africa. The eyes of the Pate people resembled Chinese and Famao and Wei were some of the names among them which were speculated to be of Chinese origin. Their ancestors were said to be from indigenous women who intermarried with Chinese Ming sailors when they were shipwrecked. Two places on Pate were called "Old Shanga", and "New Shanga", which the Chinese sailors had named. A local guide who claimed descent from the Chinese showed Frank a graveyard made out of coral on the island, indicating that they were the graves of the Chinese sailors, which the author described as "virtually identical", to Chinese Ming dynasty tombs, complete with "half-moon domes" and "terraced entries". According to Melanie Yap and Daniel Leong Man in their book Colour, Confusions and Concessions: the History of Chinese in South Africa, Chu Ssu-pen, a Chinese mapmaker, had southern Africa drawn on one of his maps in 1320. Ceramics found in Zimbabwe and South Africa dated back to the era of the Song dynasty in China. Some tribes to Cape Town's north claimed descent from Chinese sailors during the 13th century, their physical appearance is similar to Chinese with paler skin and a Mandarin-sounding tonal language; they call themselves Awatwa ("abandoned people"). When the Ming dynasty in China fell, Chinese refugees fled south and extensively settled in the Cham lands and Cambodia. Most of these Chinese were young males, and they took Cham women as wives. Their children identified more with Chinese culture. This migration occurred in the 17th and 18th centuries. Early European colonial powers in Asia encountered Chinese communities already well-established in various locations. The Kapitan Cina in various places was the representative of such communities towards the colonial authorities. The Qing conquest of the Ming caused the Fujian refugees of Zhangzhou to resettle on the northern part of the Malay peninsula, while those of Amoy and Quanzhou resettled on the southern part of the peninsula. This group forms the majority of the Straits Chinese who were English-educated. Many others moved to Taiwan at this time. Chinese immigrants, mainly from the controlled ports of Fujian and Guangdong provinces, were attracted by the prospect of work in the tin mines, rubber plantations or the possibility of opening up new farmlands at the beginning of the 19th century until the 1930s in British Malaya. Between the period of 1927–1949, some Republic of China citizens were forced to emigrate because of insecurity, lack of food and lack of business opportunity due to Chinese Civil War and Second Sino-Japanese War. Some Nationalist refugees also fled to Singapore, Sarawak, North Borneo and Malaya after the Nationalists lost the civil war to avoid persecution or execution by the Communist party of China. The Kuomintang retreat to Taiwan in 1949 saw an emigration of approximately 2 million mainland Chinese to Taiwan. After Singapore became the capital of the British Straits Settlements in 1832, the free trade policy attracted many Chinese from Mainland China to trade, and many settled down in Singapore. Because of booming commerce which required a large labor force, the indentured Chinese coolie trade also appeared in Singapore. Coolies were contracted by traders and brought to Singapore to work. The large influx of coolies into Singapore only stopped after William Pickering became the Protector of Chinese. In 1914, the coolie trade was abolished and banned in Singapore. These populations form the basis of the Chinese Singaporeans. From the 19th till the mid 20th century, migrants from China were known as "Sinkeh" (Chinese: 新客; literally: 'new guests'). Out of these Sinkeh, a majority of them were coolies, workers on steamboats, or other manual labors. Some of them came to Singapore in search of better living and to escape away from poverty in China. Many of them also escaped to Singapore due to chaos and wars in China during the first half of the 20th century. Many of them came from Fujian, Guangdong, Hainan province. Most of them paid loyalty to China and regarded themselves as "Huaqiao" (華僑). Peranakans or those English-educated Chinese who had descended for many generations in Singapore were typically known as "Laokeh" (老客: old guest) or "Straits Chinese". Most of them paid loyalty to the British Empire and did not regard themselves as "Huaqiao". At the end of the 19th century, the Chinese government realized that overseas Chinese could be an asset, a source of foreign investment, and a bridge to overseas knowledge; thus, it encouraged the use of the term "Overseas Chinese" (華僑; Huáqiáo; 'Overseas Chinese'). Among the provinces, Guangdong had historically supplied the largest number of emigrants, estimated at 8.2 million in 1957; about 68% of the total overseas Chinese population at that time. Within Guangdong, the main emigrant communities were clustered in seven counties in the Pearl River Delta (珠江三角洲): four counties known as Sze Yup (四邑; 'four counties') and three counties known as Sam Yup (三邑; 'three counties'). Because of its limited arable lands, with much of its terrain either rocky or swampy; Sze Yup was the "pre-eminent sending area" of emigrants during this period. Most of the emigrants from Sze Yup went to North America, making Toishanese a dominant variety of the Chinese language spoken in Chinatowns in Canada and the United States. In addition to being a region of major emigration abroad, Siyi (Sze Yup) was a melting pot of ideas and trends brought back by overseas Chinese, (華僑; Huáqiáo). For example, many tong lau in Chikan, Kaiping (Cek Ham, Hoiping in Cantonese) and diaolou (formerly romanized as Clock Towers) in Sze Yup built in the early 20th century featured Qiaoxiang (僑鄉) architecture, i.e., incorporating architectural features from both the Chinese homeland and overseas. Many Chinese, as well as people from other Asian countries, were prevented from moving to the United States as part of the Chinese Exclusion Act of 1882. A similar law though less severe in scope was passed in Canada in 1885, imposing a head tax instead of prohibiting immigration to Canada entirely. However, a 1923 law in Canada prohibited Chinese immigration completely. The Chinese Exclusion Act would only be fully repealed in the US in 1965 and in Canada de jure in 1947 but de facto in the 1960s with the opening up of immigration to Canada. Through most of China's history, strict controls[further explanation needed] prevented large numbers of people from leaving the country. In modern times, however, some have been allowed to leave for various reasons. For example, in the early 1960s, about 100,000 people were allowed to enter Hong Kong. In the late 1970s, vigilance against illegal migration to Hong Kong was again relaxed. Perhaps as many as 200,000 reached Hong Kong in 1979, but in 1980 authorities on both sides resumed concerted efforts to reduce the flow. More liberalized emigration policies enacted in the 1980s as part of the Opening of China facilitated the legal departure of increasing numbers of Chinese who joined their overseas Chinese relatives and friends. The Four Modernizations program, which required Chinese students and scholars, particularly scientists, to be able to attend foreign education and research institutions, brought about increased contact with the outside world, particularly the industrialized nations. In 1983, emigration restrictions were eased as a result in part of the economic open-door policy. In 1984, more than 11,500 business visas were issued to Chinese citizens, and in 1985, approximately 15,000 Chinese scholars and students were in the United States alone. Any student who had the economic resources could apply for permission to study abroad. United States consular offices issued more than 12,500 immigrant visas in 1984, and there were 60,000 Chinese with approved visa petitions in the immigration queue. Export of labor to foreign countries also increased. The Soviet Union, Iraq, and the Federal Republic of Germany requested 500,000 workers, and as of 1986, China sent 50,000. The signing of the United States-China Consular Convention in 1983 demonstrated the commitment to more liberal emigration policies. Both sides agreed to permit travel for the purpose of family reunification and to facilitate travel for individuals who claim both Chinese and United States citizenship. However, emigrating from China remained a complicated and lengthy process mainly because many countries were unwilling or unable to accept the large numbers of people who wished to emigrate. Other difficulties included bureaucratic delays and, in some cases, a reluctance on the part of Chinese authorities to issue passports and exit permits to individuals making notable contributions to the modernization effort. There has additionally been a consequential component of Chinese emigration of illegal origin, most notably Fuzhou immigrants from Fujian Province and Wenzhounese from Zhejiang Province in Mainland China, specifically destined for New York City in the United States, beginning in the 1980s. Quantification of the magnitude of this modality of emigration is imprecise and varies over time, but it appears to continue unabated on a significant basis. A much smaller wave of Chinese immigration to Malaysia came after the 1990s, holding the citizenship of the People's Republic of China and mostly Mandarin-speaking Chinese from northern China. The only significant immigration to China has been by the overseas Chinese, who in the years since 1949 have been offered various enticements to repatriate to their homeland. Several million may have done so since 1949. The largest influx came in 1978–79, when about 160,000 to 250,000 ethnic Chinese refugees fled Vietnam for southern China, as relations between the two countries worsened. Many of these refugees were reportedly settled in state farms on Hainan Island in the South China Sea. ^ "Yearbook of Immigration Statistics: 2013 Supplemental Table 2". U.S. Department of Homeland Security. Retrieved 14 April 2016. ^ "Yearbook of Immigration Statistics: 2012 Supplemental Table 2". U.S. Department of Homeland Security. Retrieved 14 April 2016. ^ "Yearbook of Immigration Statistics: 2011 Supplemental Table 2". U.S. Department of Homeland Security. Retrieved 14 April 2016. ^ John Marzulli (9 May 2011). "Malaysian man smuggled illegal Chinese immigrants into Brooklyn using Queen Mary 2: authorities". New York Daily News. New York. Retrieved 14 April 2016. ^ "Chinese New Year 2012 in Flushing". QueensBuzz.com. 25 January 2012. Retrieved 14 April 2016. ^ James D. Tracy (1993). The Rise of merchant empires: long-distance trade in the early modern world, 1350-1750. Cambridge University Press. p. 405. ISBN 0-521-45735-1. Retrieved 28 November 2010. ^ Ho Khai Leong, Khai Leong Ho (2009). Connecting and Distancing: Southeast Asia and China. Institute of Southeast Asian Studies. p. 11. ISBN 981-230-856-3. Retrieved 28 November 2010. ^ Derek Heng (2009). Sino-Malay Trade and Diplomacy from the Tenth Through the Fourteenth Century. Ohio University Press. p. 133. ISBN 0-89680-271-X. Retrieved 28 June 2010. ^ Robert S. Wicks (1992). Money, markets, and trade in early Southeast Asia: the development of indigenous monetary systems to AD 1400. SEAP Publications. p. 215. ISBN 0-87727-710-9. Retrieved 28 June 2010. ^ "Li impressed with Malacca's racial diversity and cendol - Nation - The Star Online". www.thestar.com.my. ^ Shih-shan Henry Tsai (1996). The eunuchs in the Ming dynasty. SUNY Press. p. 145. ISBN 0-7914-2687-4. Retrieved 4 February 2011. ^ Angela Schottenhammer (2007). The East Asian maritime world 1400-1800: its fabrics of power and dynamics of exchanges. Otto Harrassowitz Verlag. p. xiii. ISBN 3-447-05474-3. Retrieved 4 February 2011. ^ Gang Deng (1999). Maritime sector, institutions, and sea power of premodern China. Greenwood Publishing Group. p. 125. ISBN 0-313-30712-1. Retrieved 4 February 2011. ^ Katrien Hendrickx (2007). The Origins of Banana-fibre Cloth in the Ryukyus, Japan. Leuven University Press. p. 39. ISBN 90-5867-614-5. Retrieved 11 February 2011. ^ Frank Viviano (July 2005). "China's Great Armada, Admiral Zheng He". NATIONAL GEOGRAPHIC. p. 6. Retrieved 29 September 2011. ^ Alex Perry (1 August 2008). "A Chinese Color War". TIME. Retrieved 29 September 2011. ^ Encyclopædia Britannica, inc (2003). The New Encyclopædia Britannica, Volume 8. Encyclopædia Britannica. p. 669. ISBN 0-85229-961-3. Retrieved 28 June 2010. ^ Barbara Watson Andaya (2006). The flaming womb: repositioning women in early modern Southeast Asia. University of Hawaii Press. p. 146. ISBN 0-8248-2955-7. Retrieved 28 June 2010. ^ "World and Its Peoples: Eastern and Southern Asia". Marshall Cavendish. 24 March 2018 – via Google Books. ^ Wang, Gungwu (19 December 1994). Upgrading the migrant: neither huaqiao nor huaren. Chinese America: History and Perspectives 1996: Chinese Historical Society of America. p. 4. ISBN 0-9614198-9-X. In its own way, it [Chinese government] has upgraded its migrants from a ragbag of malcontents, adventurers, and desperately poor laborers to the status of respectable and valued nationals whose loyalty was greatly appreciated. ^ Pan, Lynn (1999). The Encyclopedia of the Chinese Overseas. Cambridge, MA, USA: Harvard University Press. p. 36. ISBN 0674252101. ^ Pan, Lynn (1999). The Encyclopedia of the Chinese Overseas. Cambridge, MA: Harvard University Press. pp. 28–29. ISBN 0674252101. ^ John Marzulli (9 May 2011). "Malaysian man smuggled illegal Chinese immigrants into Brooklyn using Queen Mary 2: authorities". New York Daily News. Retrieved 29 March 2016. Pan, Lynn (1994). Sons of the Yellow Emperor: A History of the Chinese Diaspora. New York: Kodansha America. ISBN 1-56836-032-0. Pan, Lynn (General Editor) (1999). The Encyclopedia of the Chinese Overseas. Cambridge, MA, USA: Harvard University Press. ISBN 0674252101. Lary, Diana (2007). Diana Lary (ed.). The Chinese State at the Borders (illustrated ed.). UBC Press. ISBN 0774813334. Retrieved 4 January 2013. This page was last edited on 16 April 2019, at 12:35 (UTC).